Brick Battles is loads of fun for kids and grownups alike, and has been a big hit in the minis hall at Gencon every time I bring it. The rules are quick and easy to learn, with kids as young as 7 or 8 being able to learn and play in minutes. 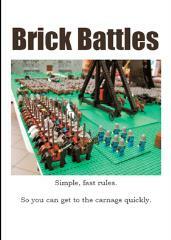 As written, the rules are aimed more for castle (and similar) sets, but are easily adapted to any setting.